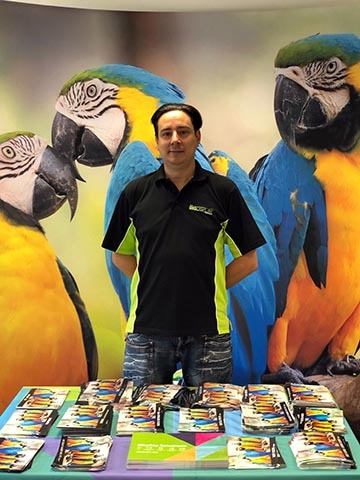 Ottawa, Canada – Large format print service provider the Big Display Company of Slough, UK, has gained an estimated 30 percent production time since investing in tilia Griffin automatic layout software. The application from Tilia Labs, a leading developer of planning, imposition, and automation software solutions for the graphic arts industries, was chosen for speed and ease-of-use in automating nesting processes for the full range of large-format production devices. The Big Display Company has invested in a wide range of equipment since its establishment in 1998, including facilities for premium-quality UV, solvent, sublimation, aqueous and latex printing as well as in-house finishing. The wide array of proprietary software across all devices has created difficulties in standardizing work across all production. “We had so many different printer brands and models, each with its own RIP and software quirks, there were a lot of issues especially in the interface with the cutter,” explains Arturo Benjumeda, Artwork Department Manager. “We wanted one single software solution for laying out and cutting that could work with all devices, so that there would be no more than one set of issues regardless of which machine the products were printed on. With 28 team members, ease-of-use was paramount in the decision process for the Big Display Company. Tests of tilia Griffin revealed a powerful cross-platform, automatic layout solution for large format printers, which is both feature-rich as well as intuitive and ultra-responsive in operation. The whole team was up-to-date and confident using the system within a couple of days. At the core of Griffin is the Imposition AI engine, which provides the ability to search across millions of combinations in minutes to find the most cost-effective, tightly-nested layout, whether for a single job or a combination of multiple jobs. tilia Griffin is also vendor neutral, designed to provide the same efficiencies with virtually all printing and cutting machines. With customers demanding ever shorter turnarounds on even the most complicated jobs, the time advantage has already been soaked up by new production demand and deadlines. The company is now looking forward to the new improved banner hems and eyelets feature projected for the next major Griffin update. Arturo Benjumeda, Artwork Department Manager, The Big Display Company.